When you visit the Lloyd Center this December you may have a tough time finding the creature featured. It is not because it is non-existent; it just happens to be that the winter flounder (Pleuronectes americanus) is great at blending in to its natural surroundings; we know this practice as camouflaging. When we think of camouflaging, chameleons come to mind. They quickly change color to escape from danger. The winter flounder can do the same. But the million dollar question is: how does it work!? The reasoning behind this great phenomenon comes from the special pigments within the cells called, chromatophores. 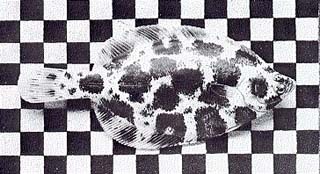 Some of the cells on the body of the fish are able to change color intensity and pattern. Scientifically speaking, “each chromatophore consists of a central cell containing pigment granules. This cell is surrounded by 15-25 radially-arranged muscle fibers, which are innervated by motor neurons whose cell bodies are located in the chromatophore lobes of the cephalopod brain. What did we all learn from that scientific explanation? Nature is unbelievable! Within each cell, there are nerves that are able to change the intensity of color to match its surroundings. Now if only we could do such a thing! Enjoy the month of December, do not go into hiding, and visit the Lloyd Center. Happy Holidays! !